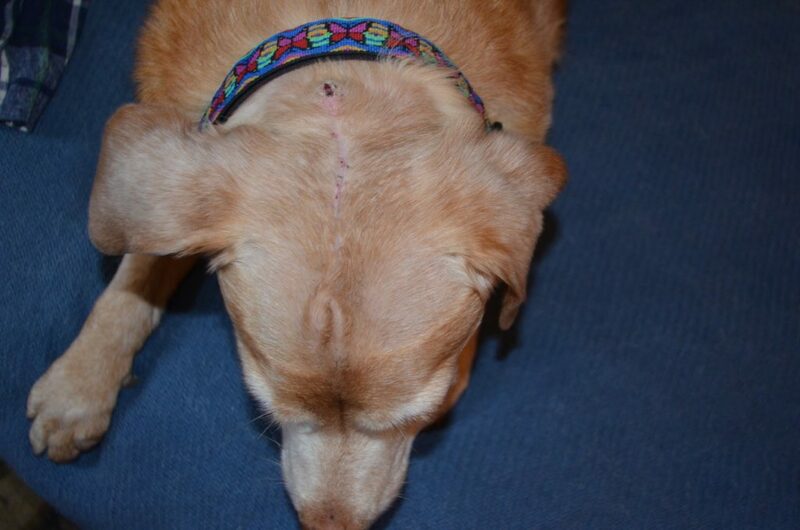 The day before Millie had her eyes removed, Darla had yet another cancerous tumor removed — this one from the top of her head. I took that photo above this morning, showing you the scar that’s left. Ironically, just two?weeks before her surgery, I had taken Darla to Peak for a check-up, where?both our oncologist and internal medicine specialist had examined her. And the oncologist and I together did a complete check of Darla’s body, by hand and sight, for any new growths. Our veterinary surgeon at Peak, Dr. Kurt Schulz, had already done four operations on Darla to remove cancerous mast cell tumors in the past two years. These things keep popping up on her skin as small growths, in different sizes and shapes and in different parts of her body. So that’s what we were looking for that day, combing through her hair hunting for any new growths. There was nothing. That was on Thursday. I emailed that photo to our oncologist at Peak, Dr. Kendra Knapik, on Monday, and she called later that day. She suggested?I have our local vet clinic do a fine needle aspirate and send it out for lab analysis, which we did a couple of days later. The pathologist’s report came back saying it was “most consistent with mesenchymal neoplasia,” recommending it be removed and sent in?for further analysis. A few days after the surgery, Dr. Knapik called with good news on the latest pathology results: It was a low-grade soft-tissue sarcoma, with very clean margins, and the chances of it spreading were less than 10%. Of course, we’ll need to continue to be vigilant and monitor her closely for any new growths. 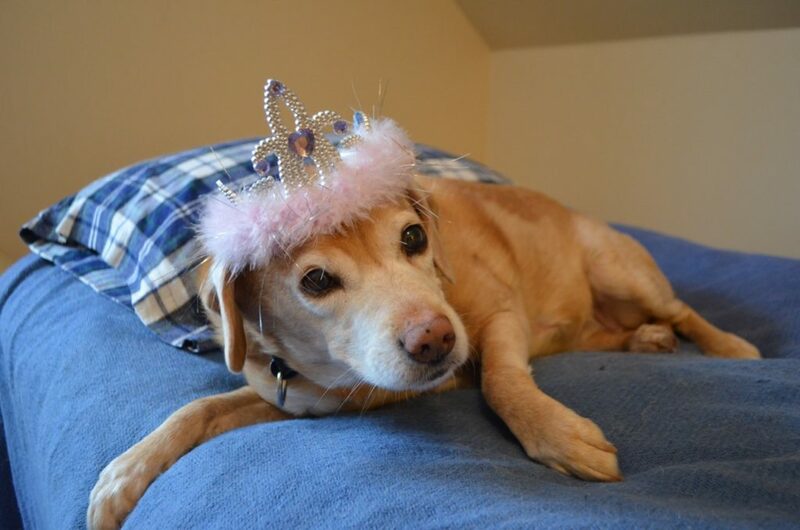 Besides, not only is the tiara appropriate for Miss Princess, but it helps hide the’scar until her?hair grows back. So there, she says. Awwwwe. That is so cute. STEVE – could we have an update on the horses? I’m so glad Darla finally got her tiara! She is indeed a worthy Princess. Just look at that face! What a precious queen! I need a tiara myself. I had brain surgery 3 weeks ago, so I need something here! Yes, she is worth every penny. Love you guys. So glad to hear the Sarcoma appears to be mild. And I love Darla’s tiara. Glad to see she still has her sassiness. It’s amazing that a lump can appear is such short a time. And a little frightening. I’m so glad that once again she came through with flying colors. And the tiara does hide the scar. And we all agree she’s more than worth the expense. Glad she’s not TOO spoiled. ha ha! Also really happy to hear that Wilbur is doing well. Aw, what a sweetie in her tiara! And a good sport for putting up with all those trips to the vet and anesthesias and cones and… It takes a lot of sacrifice to achieve these world records. 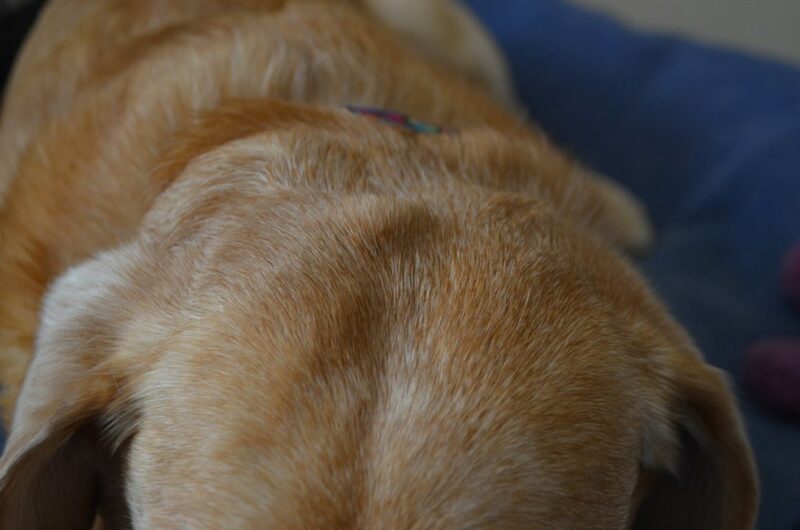 Our elderly dog had a suddenly-appearing tumour. It was on his leg, just above his paw, and came up literally overnight, the size of a large marble, although biopsy showed it wasn’t malignant. Still very scary to see something like that appear out of nowhere. The definition of a strong Princess!! She rocks her tiara!!! Glad she is doing good!!! Thank you for your continued care & compassion for all your residents!!! She sure earned that crown. Ah, you guys continue to have a way of turning a troublesome topic into entertainment. Good news for Darla, and catching it quick. Her royal highness continues to provide entertainment!! LOVE THE TIARA & DARLA & YOU BOTH FOR DOING WHAT YOU DO. Darla couldn’t be in more capable hands than she is with you! She’s a princess in the home of a king and a queen. So glad for good news and that last picture of Darla—priceless!